Libertarian presidential candidate and former New Mexico Gov. 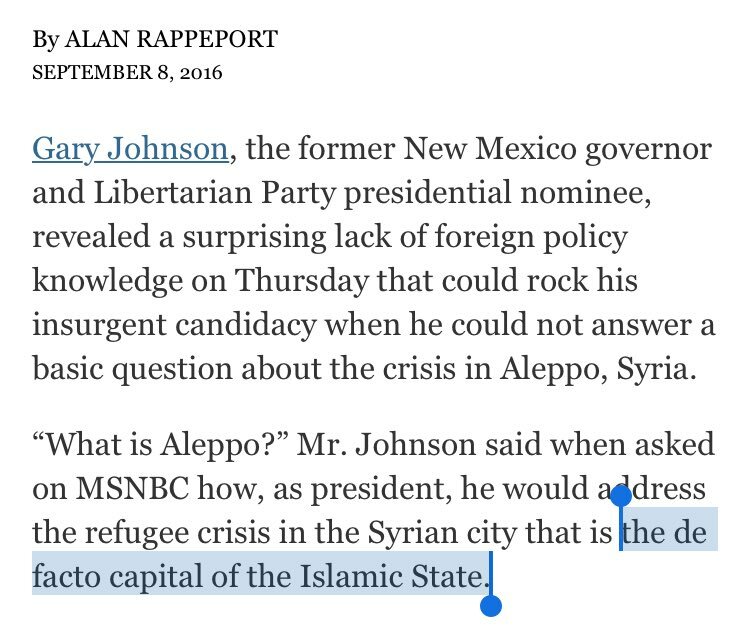 Gary Johnson went on MSNBC's Morning Joe today and admitted in response to a question about Aleppo, Syria, that he had no idea what "Aleppo" was. This was a pretty big mistake for someone who is likely to get millions of votes in the upcoming presidential election, so the New York Times wrote a story about it. Except that its story misidentified Aleppo. Here's the problem: Aleppo is not an ISIS stronghold, either. It's a divided city that doesn't have much of an ISIS presence and is the site of heavy ongoing fighting between the Syrian government and other rebels. So the Times had to change its story again. Meanwhile, a gentleman named Christopher Hill who was the U.S.'s ambassador to Iraq under Obama also made the Raqqa/Aleppo mistake while ostensibly having a laugh at Johnson's expense. The funny thing about this whole hit job is that Aleppo would be much better place if the neocons now funding Wahhabi mercenaries to fight in Syria did not know what Aleppo is. But sadly for Aleppo they know what it is and have pumped in enough money, weapons and fighters to keep the war going for almost 6 years now. Now aren't we all glad that they know what Aleppo is? Also, its not that he did not know what Aleppo is, its just that with the weird way he pronounced the city threw him off that he needed a moment to think about it. Umm, I think the media can see Russia from there. Washington Post. Of Course, got a good deal being an Amazon Prime Member. They also supported Bush's war in Iraq. 4. Umm, I think the media can see Russia from there.